Like most plants, there are definitely sky pencil holly problems. This type of broadleaf, evergreen shrub is susceptible to certain diseases. Although grows from 4 to 10 feet high, it can easily turn brown and potentially die if the infestation is great. Sky pencil is an excellent choice of shrub because it grows really tall rather than spreads wide. It can be a great landscape as it is neat to look at and almost displays like a fence. Unlike the common rounded shrubs, this doesn’t require a lot of pruning. What must be dealt with are the sky pencil holly problems. Let’s identify those problems to have a better understanding on how they damage the plant along with some simple solutions to deal with each. Botryosphaeria canker, also known as die-back, is one of the common sky pencil holly problems. This is a type of bacteria called botryosphaeria bacteria. It typically affects a broken or cut branch and stem. It can entirely damage the plant, and not just a section of it. Once infested, the shrub starts turning into brown and then black. Since the stem is where the nutrients are stored, this disease is able to stop that normal flow along with the movement of water. Hence, it dries up and eventually falls down or collapses, which indicates death. The simple solution for this is to cut off any infected stem to stop the spread of the disease. It also helps if you regularly check for broken stems and immediately remove off the plant. Web blight, which is otherwise called as rhizoctonia aerial blight, is among the sky pencil holly problems you must also be familiar with. It is most likely going to infect your plant if it’s exposed to a combination of extreme weather conditions at the same time. It can be a very warm temperature or a high percentage of humidity and then a heavy rainfall afterwards. The real problem here is that you won’t be able to find out the plant is already infected until it’s too late. It spreads very quickly too, and the damage begins at the lower leaves. To avoid this, it’s best to water the plant every morning and spray some fungicide. It also helps keep good air circulation so better choose an area with lots of drainages. In all sky pencil holly problems and diseases, leaf spot is probably the easiest to identify. As it names suggests, this disease makes the infected leaves some yellow spots. It is even more noticeable by the irregular shape of the spots. This is caused by cylindrocladium, a type of fungus. You need to fix this immediately, or else, if left untreated the shrub’s going to die. You can still save your plant by removing all the affected leaves while the spots are still yellow. Once they turn into purple or black, they’d die and fall off, and possibly all leaves are going to be de-attached. You also make sure to clean the surroundings. Often times, debris are the cause of the fungus to develop. Also included in the list of the most common sky pencil holly problems is root rot. This may refer to Pythium, Phytophthora,and Thielaviopsis black rot. It happens once the soil where it is planted retains moisture as this can prevent the penetration and circulation of oxygen. This is more likely a result of a mistake during the initial planting. If you’ve chosen a heavy type of soil rather than a fast-draining one, it can lead to root rots. It is also caused by too wet or soggy soil. Once infestated, the roots of the plant become brown or black and usually mushy. Eventually, they die causing the whole foliage to turn into yellow and die in a matter of days. What you must do is to avoid over watering the shrub. It can be a big helpf I you add some healthy stock in the loamy soil. 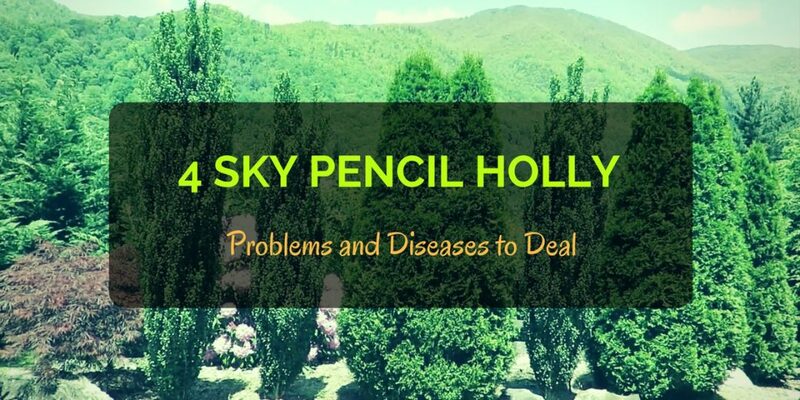 Each of these sky pencil holly problems can occur more than once in a year. However, if you do know how to take care of the plant, it is less likely to happen. Regardless, always keep in mind the basic care and maintenance required in order to avoid dealing with diseases and pests. Will Roundup Kill Trees? This is Unexpected!